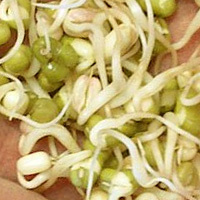 Mung bean sprouts or moyashi in Japanese are the sprouts of mung beans. Mung bean sprouts are lower in calories than soy bean sprouts. They are said to go good with stir fry and ramen noodles. It is a good source of vitamin K, folate, and vitamin C with dietary fiber. The calories in Mung Bean Sprouts per 243g(1bag) is 34 calories. Mung Bean Sprouts is calculated to be 14Cal per 100 grams making 80Cal equivalent to 571.43g with 6.32g of mostly carbohydrates、4.13g of protein、0.24g of fat in 243g while being rich in vitamins and minerals such as Molybdenum and Folate.